We wrote a post on eBay retail arbitrage, termed by them as drop-ship listings, in 2017. Since then, the problem has only gotten worse, with something around 150 currently listed items on eBay that are merely fronts for our parts sold on Amazon.com. To refresh your memory on how this works, someone lists something currently sold on Amazon.com on eBay, with a markup. When the order is placed on eBay, they have software that automatically places the order on Amazon.com with the eBay purchaser as the recipient. We don’t like it as we prefer our customers get the items at a more reasonable price, and it can result in some odd activity on the other end when such drop-shipping sellers leave us negative feedback on Amazon.com; negative feedback on Amazon.com is a huge problem as compared to eBay. on eBay, most buyers are motivated to leave feedback, whether they had a good or bad experience. An Amazon.com, feedback is not at all integrated into the ethos of the site; there are disproportionately more negative feedback reviews per sales volume than on eBay because most of the people with a positive experience don’t bother to leave feedback. 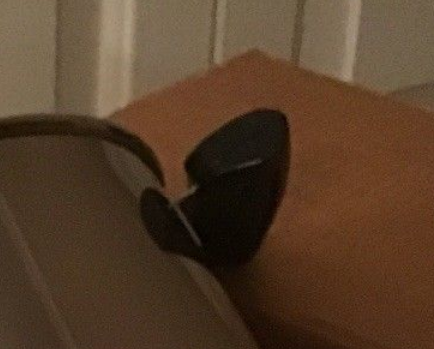 eBay has a policy against drop-shippers that don’t actually hold inventory. However it appears they don’t actually enforce this policy (see the chat with eBay support in that article). In any event, what we worry most about is the damage to our brand that a poor buying experience can have. What I mean by that is, our primary purpose in selling these parts is to make people happy and to provide them with a satisfactory buying experience. Given the pain that Revere Ware owners went through for decades before we came on the scene 10 years ago. Most people are thrilled that our parts are available, and we don’t want to temper that with a bad experience. So, please buy our parts from our own website or Amazon.com, not from eBay, as we don’t list any parts there. 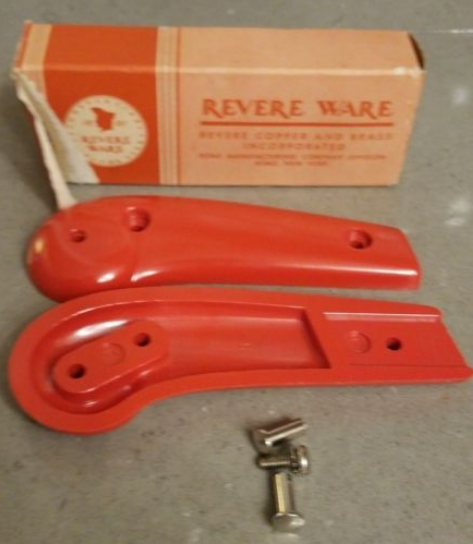 While the official Revere Ware brand may be gone, it certainly hasn’t been forgotten, as we are reminded this week seeing Google search results for Revere Ware. It seems that major retailer still see good reasons to try and draw people in using the Revere Ware brand, even though they don’t offer any actual Revere Ware products. 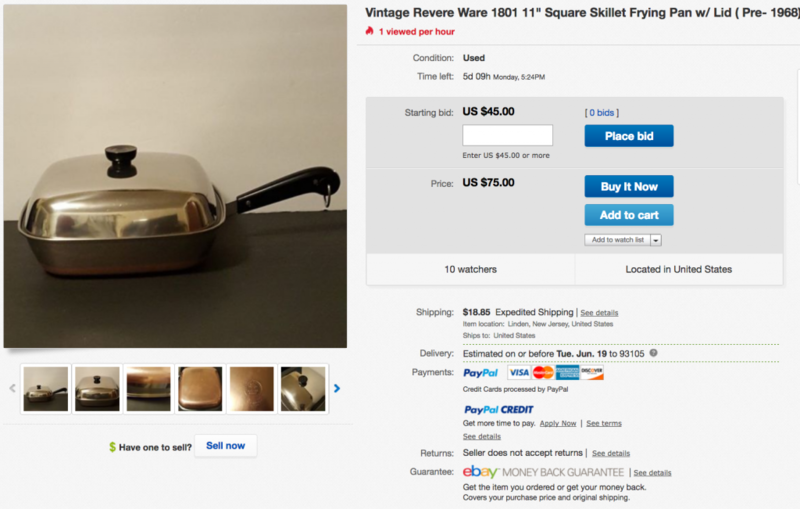 Neither the Bed Bath & Beyond link nor the Wayfair link lead to any actual Revere Ware products. Interestingly enough, as Google Trends shows, Revere Ware as a search term is actually getting slightly more popular. Who knows, this may be a second renaissance for the brand now that it is officially dead, which nostalgic interest building, plenty of inventory in the used marketplaces, and prices relatively reasonable still. 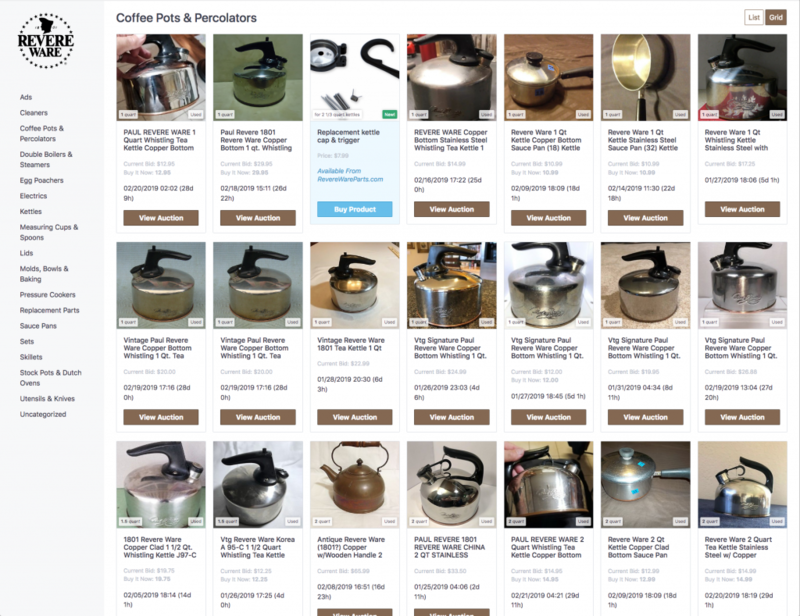 In 2010, we created revereware.org to make it easier for people to find Revere Ware cookware on eBay. 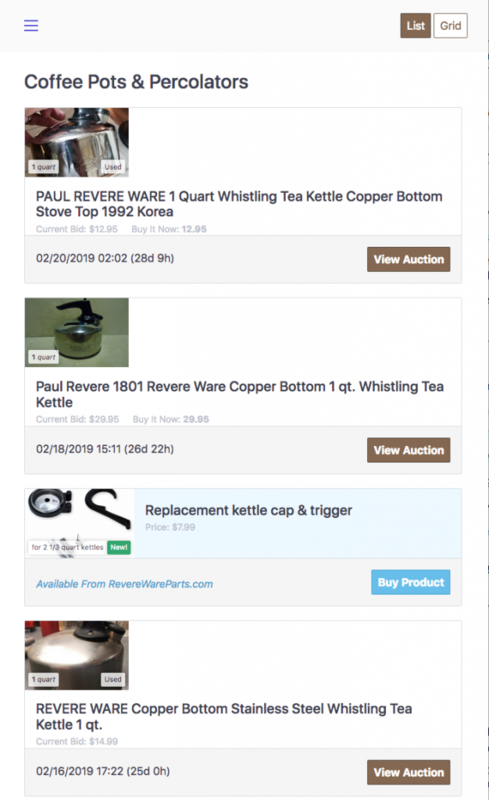 The site downloads and categorizes all Revere Ware listings on eBay every 30 minutes, making it easier to find the exact item and size you need. In 2013, we updated the site to be prettier and work better. Since then, mobile devices have become much more prevalent and our site didn’t work particularly well on smaller screens. We are happy to announce a complete overhaul of the site which is now, in the language of web technology, fully responsive. This means that it will display well no matter what size screen you are using. 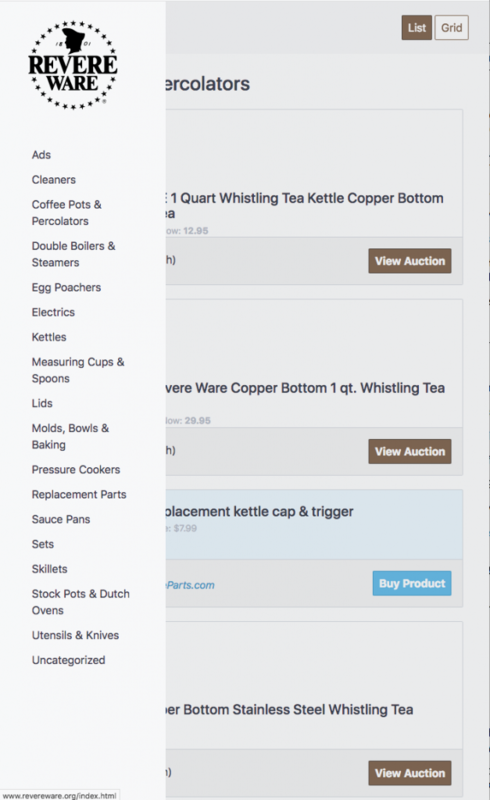 Here are some screen shots of the new design. You can find the site here. The site has a handy grid view as well, in addition to the default list view. 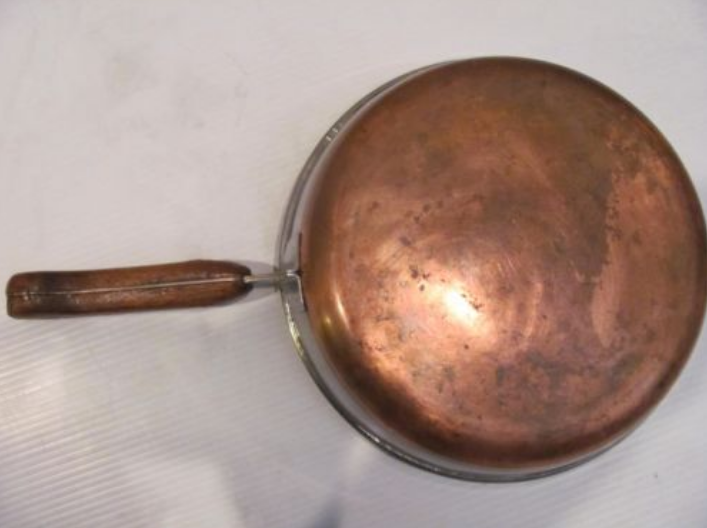 Here is an interesting piece currently for sale on eBay, a 10 quart stock pot. First of all, what a great starting price for a new in box (NIB) item, only $35. 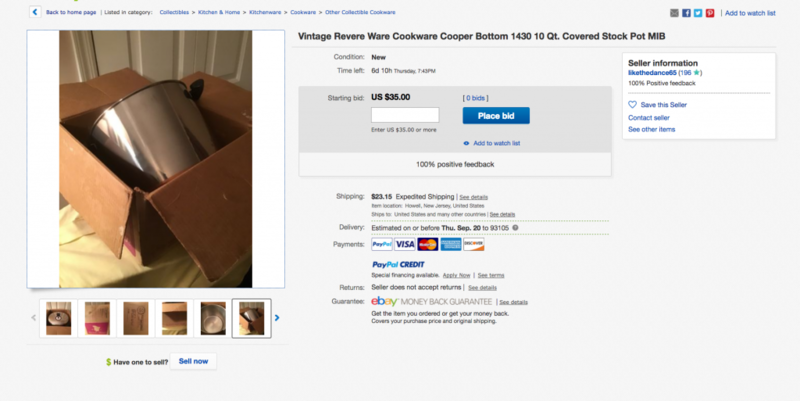 If you are looking for a nice Revere Ware stock pot, I’d jump on this. What makes this interesting is the confluence of styles. 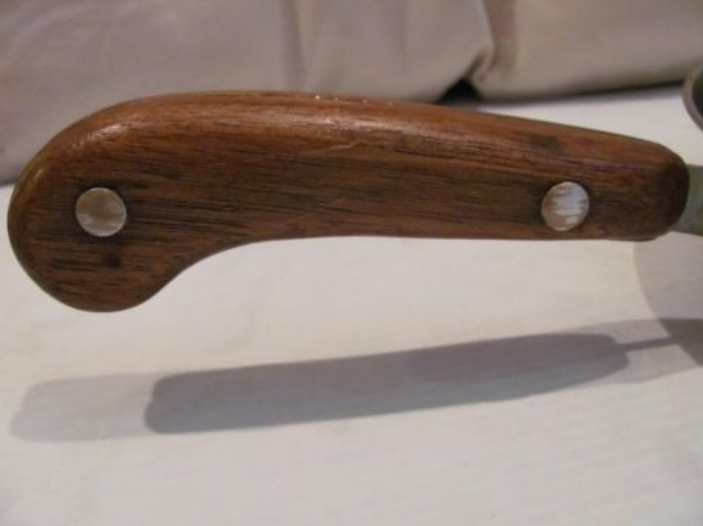 On the one hand, it has the vintage handles. 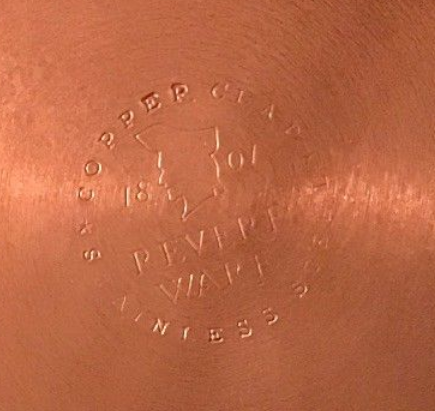 On the other hand, it does not have the process patent stamp, which I’ve always seen on this style stock pot (with those handles). 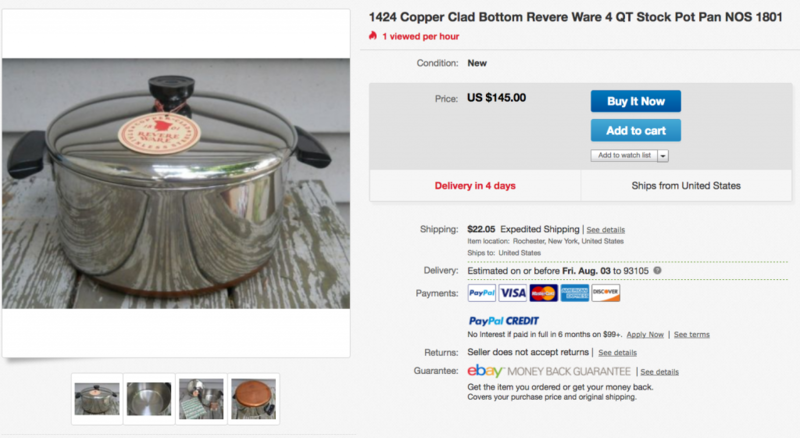 I also don’t believe I’ve ever seen a 10 quart stock pot with those style handles. 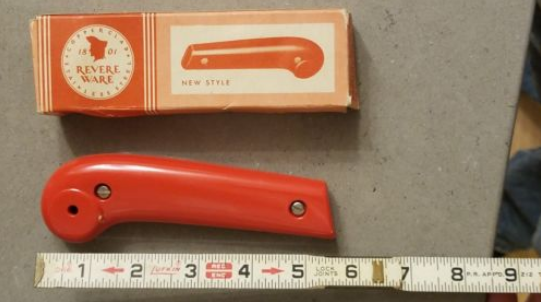 My guess is that this is something that was produced around 1968, just when Revere Ware was transitioning from the vintage era to the newer (cheaper) era of cookware. 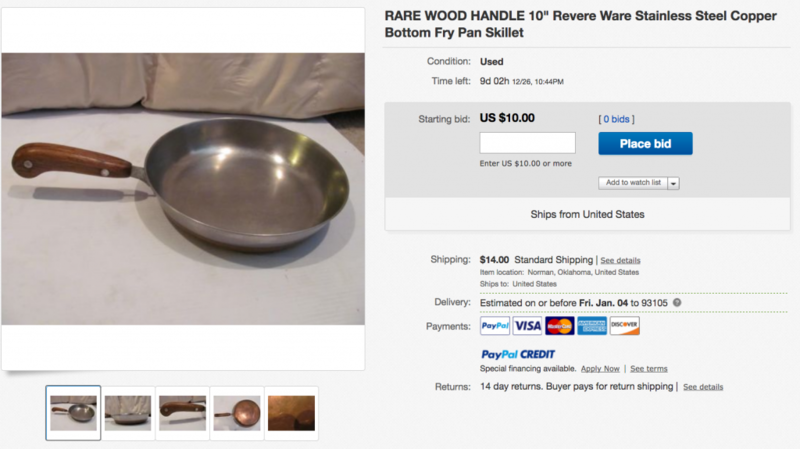 I’ve always thought these pots were about as rare as the square skillet. 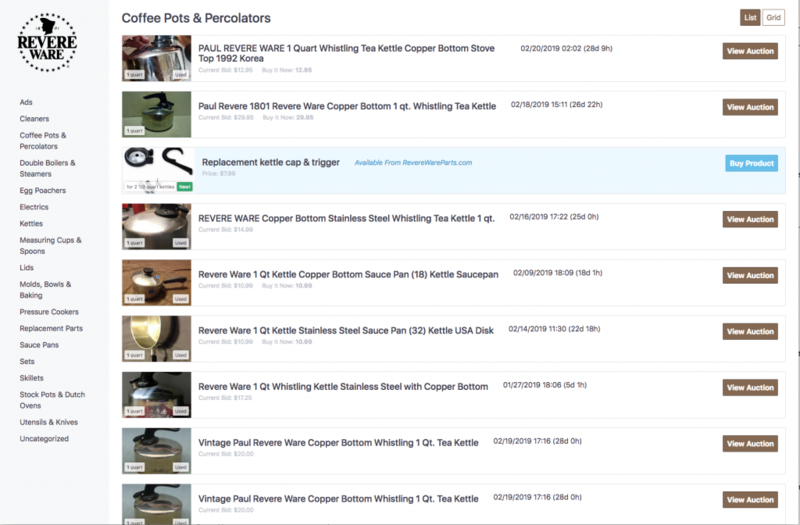 This week has us finding a lot of great deals on some nice bail handled pots (one, two, and three). The 8-quart one in particular is pretty uncommon from my experience. In fact, there are quite a few available on eBay right now for pretty cheap. 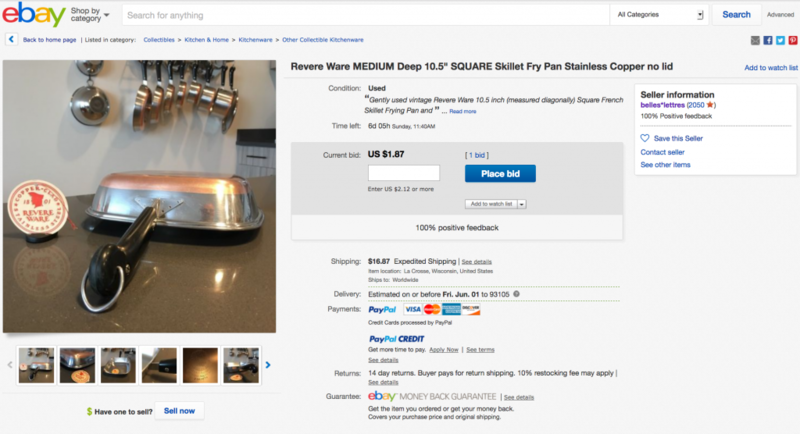 The deals on square skillets, one of the more rare and typically pricey items for sale on eBay, continues, with the two below (one and two). 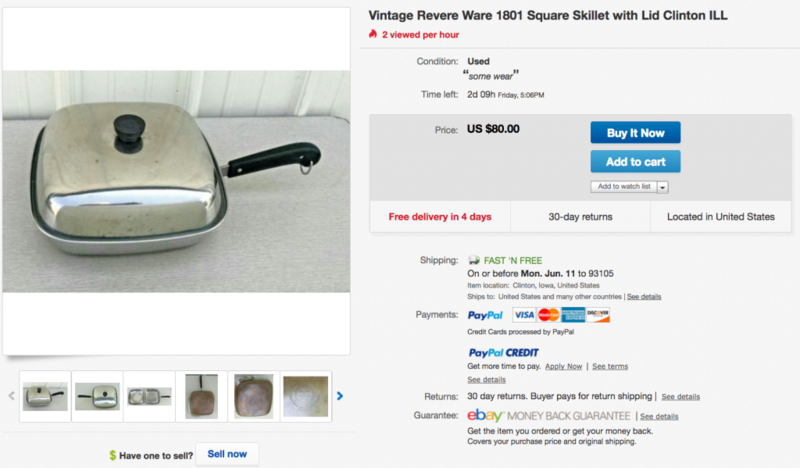 If you have always wanted a square skillet, either one of these would make a great addition to any collection. 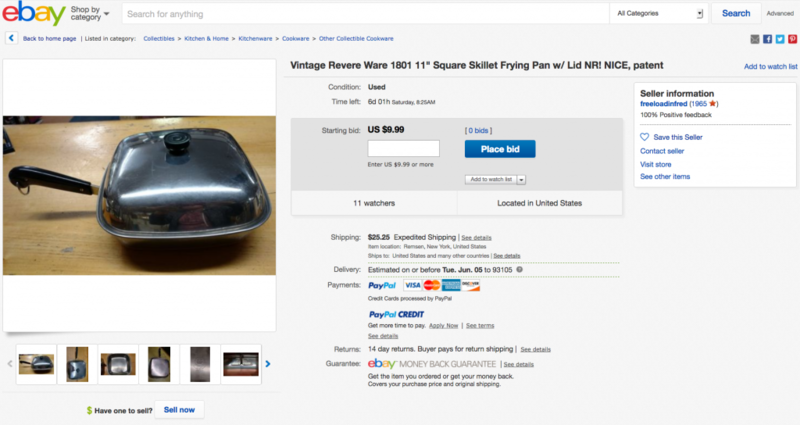 Square skillets are almost always listed for $100 or more on eBay, as either a starting bid price or a buy-it-now price. But there is little indication of whether they are actually selling at that price. 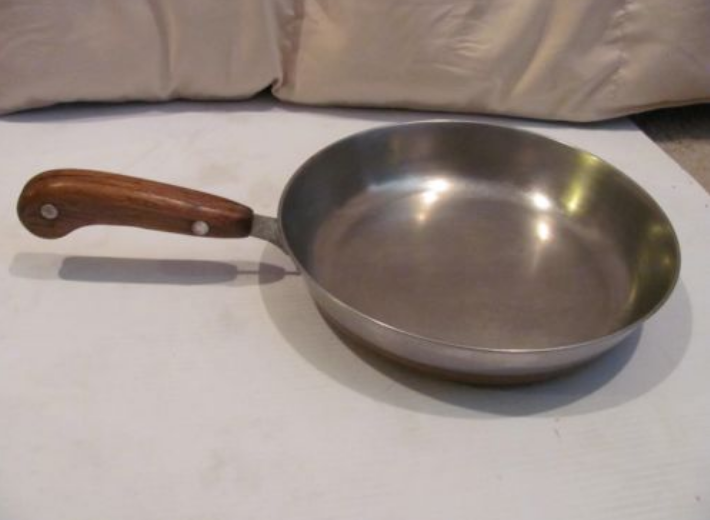 Here is one that should be interesting, an auction for the 11″ (larger size) square skillet starting at just $9.99. 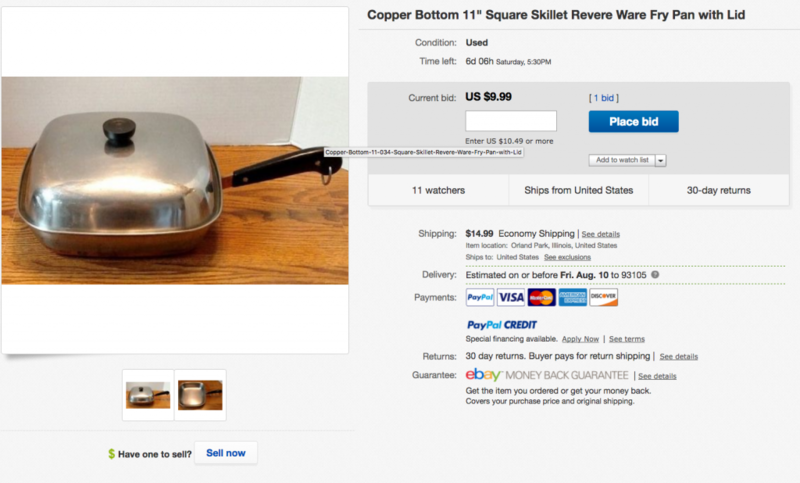 If you are looking for a square skillet, this is a great one to bid one. It will be interesting to see what it ultimately sells for. Here is another square skillet starting at a very low bit (although this one has no lid).